I welcome my friend and Author Allen Boyer to my blog. His latest book The Blair House Cat Mystery was recently released by Cozy Cat Press. It is the second in the Dupree Sisters Series. I am always intrigued by the quirky behavior of cats. So when the Dupree Sisters find a cat on their doorstep and it has a spot of blood on it, one wonders what the cat has been into. We soon realize this stray cat knows more than it’s meowing indicates and the Dupree Sisters are kept busy unraveling a mystery surrounding our nation’s capital. What secrets are the Washington elite keeping? I am not quite finished with the book as I just got it but I am enjoying it immensely. I hope to finish it later today. I haven’t guessed whodunnit yet and probably won’t because this book is skillfully written. So far I give it five stars. Now, remember if I can’t give a five or four star review on this blog I don’t post it. Let’s meet Author Allen Boyer. Tell us a little bit about your life? It’s a balancing act as a writer and a father of three children. Daily commitments take priority over writing time, which is okay. In an odd way, they actually complement each other. When I work on a book, sometimes I need a break and throwing a baseball or playing ping pong with my kids is a good way to let my mind fire on some creative ideas. Getting time away from the laptop also helps to maximize my writing time. When I sit down to write I know exactly what I’m going to do. You have two series out the Bess Bullock Series and the Dupree Sisters series. The longer a series goes on, is it more difficult to write the next book because you might worry about readers not liking it as well as the others? Yes, I thought about that. Another concern for me was how some book series lead to the eventual killing off of regular characters. I didn’t want to go down that road, which is why it’s taken such a long time to get another Bess Bullock story ramped up. The next book, Discreet in the Heat, will be out later this year. The theme of the book will be about the concept of “home” and how each person defines home in a different way. Also, part of the storyline will involve a new life being brought into Bess’s world and the ripples it creates. I had a friend name Charlotte Bouton, who has since passed away. She was in her eighties when I knew her. She had worked in the House of Representatives for many years. Worked with historical figures like John Kennedy and Al Gore Sr. When I knew her she was always perfectly dressed and sweet to talk to, but when the topic of politics came up she would be tough as nails on politicians and candidates she considered “lightweights.” I liked that contrast of having this person with a grandmotherly appearance but, under the surface, having these great political experiences and this tough mindset about how Washington D.C. worked. Tell us about your latest book, Blair House, Cat Mystery. It begins with a stray cat that keeps following the sisters home from church. Of course, they begin to feed the cat, leading to it coming around more often. One day, when the cat arrives with some blood on it, that’s when the story takes them to a dead body and love letters from an unknown author. So the Dupree sisters have to connect the clues to learn the truth about what happened. What is the most quirky character trait of the DuPree Sisters? Ruth Dupree, the younger of the two sisters, has presidential quotes that she likes to pull out for a variety of occasions. I think she does it to impress other people, but it drives her sister, Charlotte crazy. I think Charlotte has probably heard the same quotes too many times. What are your characters most serious flaws? They don’t have a thick skin all the time. Things happen that get them upset, or angry and sometimes their emotions can cloud their judgment. There are many fictional characters who are emotionally distant and nothing ever bothers them. We’re all people and we all have to deal with our emotions. Ruth and Charlotte are no different. Why Washington DC as the setting for mysteries? Part of it goes back to the fact that my friend Charlotte Bouton worked there. Another reason is that I live a few hours from D.C. and my wife and I like to take our children there during the summer for day trips. It is a beautiful city with many layers to explore. Checking out all the museums, buildings, monuments, and restaurants make for interesting trips. Kids again, but fortunately there are many more smiles in the day. Are you a full-time writer? If not what is your career and how does it lend it to your mysteries? I’m a technology teacher at an elementary school. I have a good eye for observing people and I think that benefits me as a teacher and a writer. Tell us about your Bess Bullock Series and how it differs from the Dupree Sisters. And do you have any other books out? Bess Bullock is Sherlock Holmes in a retirement home. She notices the little details. She has a good eye for people and will spot curious behaviors to investigate. So in a typical Bess Bullock book, she’ll find a number of little mysteries to investigate and resolve. The reading is light and the stories focus on human nature. Charlotte and Ruth Dupree aren’t that observant. They are longtime socialites so they have a lot of social connections to reference whenever they get stuck in an investigation. The Dupree Sisters Series takes more of a traditional approach of having one death to investigate. What is next for Allan Boyer? I have a goal of finishing the next Bess Bullock book, Discreet in the Heat, by June. So I’m pressed for time to finish it, but I’m more than halfway there. I’ve never released two books in the same year so that’s a new goal to meet. After that, I’ll be going up to Canada for a week with the family to get away. I’ll be putting away the laptop and grabbing lots of notebooks to fill while I sit by a lake in the middle of nowhere. Just that I find it very satisfying to create a story that gives people an escape from their job, or worries, or routine of the day. It really is a privilege to do that. Allen B. Boyer lives near Hershey, Pa with his wife and three children. He also lives near a retirement home that he visits with his children and his dog, Buster. 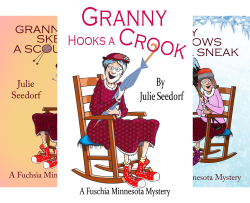 If you enjoyed Gumshoe Granny Investigates, please check out Bess in her second book, Clues Over Croissants, as well as Married To Mysteries, Whispers In Winter and Suspicions at Sunset. A second mystery series was begun with Death at The Presidents Church, the first installment that features two elderly sisters who use their social connections in Washington D.C. to solve mysteries. The first book dealt with the death of a homeless man. The second book in the series, The Blair House Cat Mystery, is just released. Thank you so much for taking the time to meet Allen. Happy Reading. My Interview with Cozy Cat Press Author Allen Boyer.